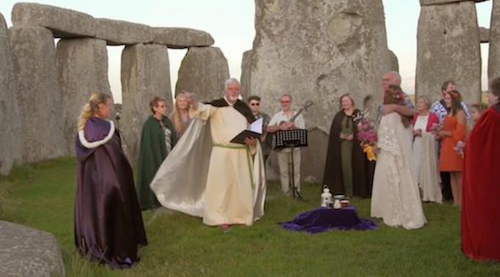 Stonehenge, UK with Meaghan and Nick (from USA) celebrating a spiritual ceremony including Buddhist/Celtic tradition with handfasting. What a wonderful wedding pic. Thanks for sharing. Awesome location for a wedding. Did you really get to officiate at a wedding at Stone Hedge? How Totally Cool! Loving the bride and or minister in this photo !!! How beautiful. What a wonderful place to be married.